The Blanket Fairy's Mission is to make and donate as many blankets as she can to children with pediatric cancer. The Blanket Fairy follows many blogs & websites and when she sees a child that needs a lift in spirits while going thru treatment she will contact their parents to have their child go into her Sprinkle Dust Treasure Chest to pick out a blanket or any other item that may be available in there. 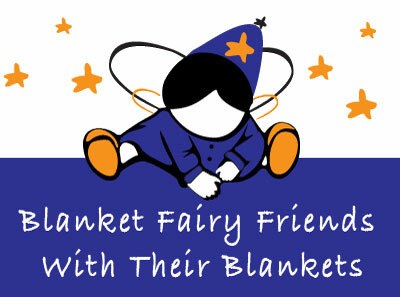 The Blanket Fairy has very,very, soft blankets that will help children stay warm especially when they are sick. These blankets will help bring comfort to children as they go thru their treatment for cancer. The only thing The Blanket Fairy asks is that she get a picture of the child with their blanket or gift so she can post pictures on here for all the Volunteer Fairies around the world to see. The Blanket Fairy has many wonderful volunteer fairy opportunities available, please check out the Volunteer Fairy Options on this website for more information on how you can become an Official Volunteer Fairy. The Blanket Fairy humbly accepts monetary donations to help out with shipping and fabric material costs. Contact The Blanket Fairy if you would like any additional information about volunteer opportunities to help grow this cause, and ultimatley sprinkle smiles & comfort to as many children as possible. The Blanket Fairy is currently not a 501c3, so donations are not tax deductible. The Blanket Fairy hopes to achieve 501c3 status is the near future. Currently, The Blanket Fairy can only cover the children living in the United States due to international shipping charges. Thank you for visiting our site and we hope you can join us on our mission of sprinkling smiles and comfort to children with Pediatric Cancer. Join the Blanket Fairy Community on Facebook. We are a very active online community that has a common goal of spreading awareness about childhood cancer. The Blanket Fairy is built by a foundation of loving Volunteer Fairies from around the world. If you are interested in becoming a Pediatric Cancer Awareness Fairy, please check out the information below about how you can join our team.